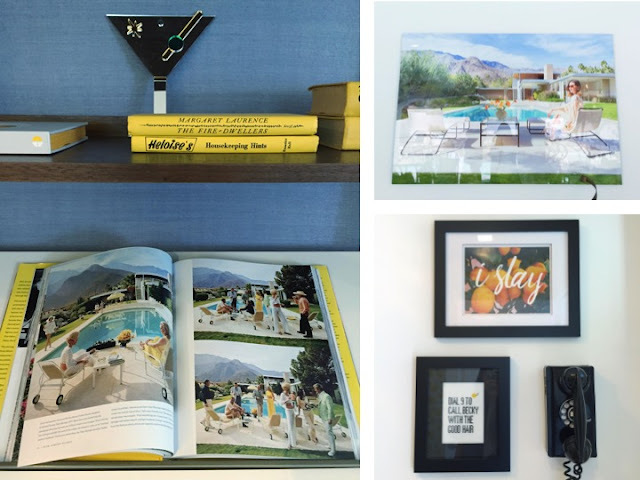 The bright doors on mid-century modern homes, endless green golf courses and sunshine filed days best remedied by cool blue pools and (spiked) Arnold Palmers. It's hard to ignore the 70's inspired design aesthetic in this small dessert city just 100 miles east of Los Angeles. 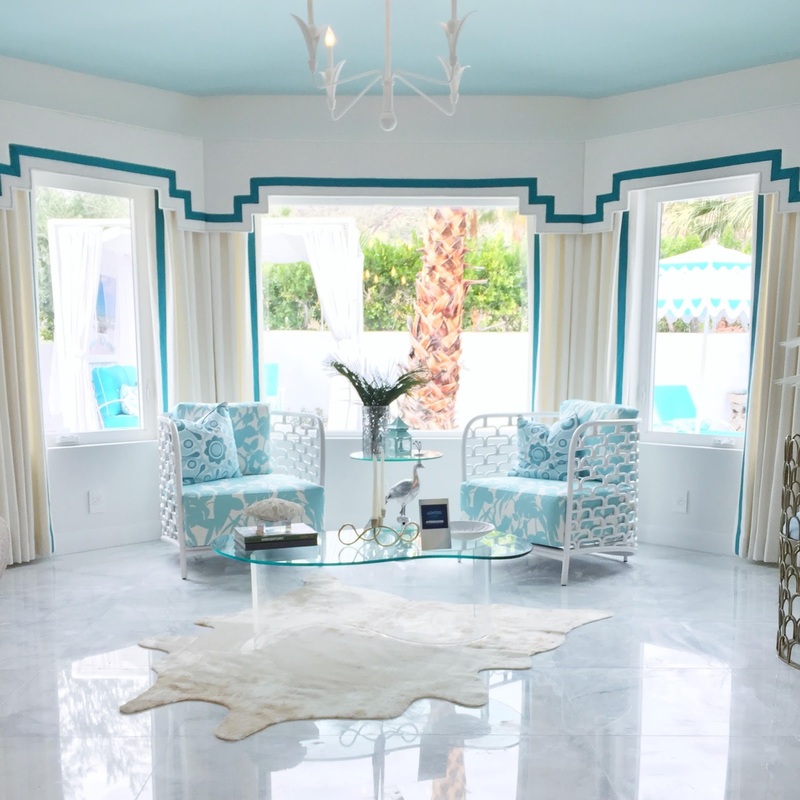 This past weekend I attended the Christopher Kennedy Compound Modernism Week Show House, which is an opportunity for decorators to create their own space during Modernism Week, a celebration of design culture and preservation in Palm Springs. The icing on the cake for me was this year's show house muse, Kelly Golightly, the darling of Palm Springs who runs a style guide for modern day Audrey Hepburn's and with whom I find to be the most perfect representation for the burgeoning reestablishment of city's chic resort style. This year Christopher Kennedy partnered with Kelly to renovate her home and keep the Palm Springs Dream alive and well. The result, I must say, was absolutely fabulous. Enjoy. I must say, my love for the blues really came to fruition here. 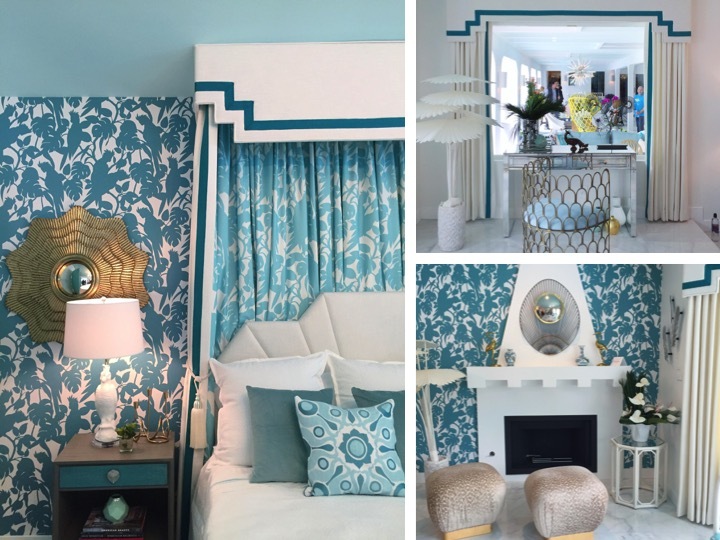 What Allison Mattison and Liza Sharp of Trellis Home did so well was remain traditional in theme but add fun resort-like elements into the details. The tropical print wallpaper, cool marble floor and airy open space centered by a lovely view of the pool really made it completely appropriate for the year round high temps. I especially loved the desk/vanity setup looking out onto the outdoor living area, such a lovely view! Americans live in their kitchens and that is why I absolutely love this setup by Kelli Ellis! I can easily imagine spending tons of time in here, cooking on one end of the island and drinking wine with friends on the other. 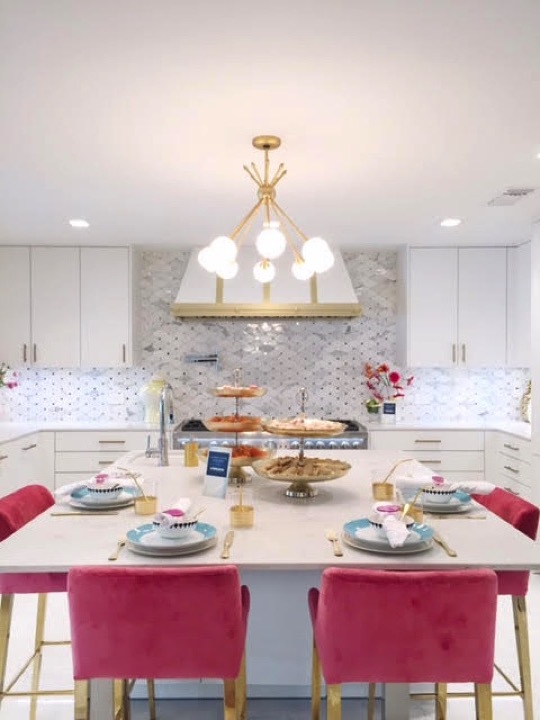 I must say, I am not a huge magenta fan, but I think the beauty of this white and gold color scheme would easily allow for an easy swap out of chairs and floral arrangements to mix it up. 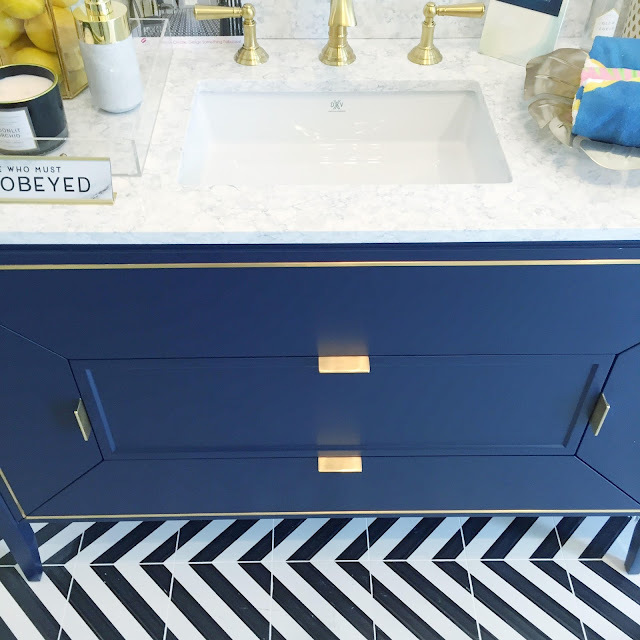 The gold and white details are done in very good taste here, but I am obsessed with this marble farmhouse sink! Leaving some fresh white roses inside was a good touch I might add. The plates and cutlery are so pretty, I think it's such a wonderful way to add color without seriously committing to one pattern or theme for too long. The navy and white marble combo is a great one and I love the addition here of a black and white tile pattern and the gold hardware. 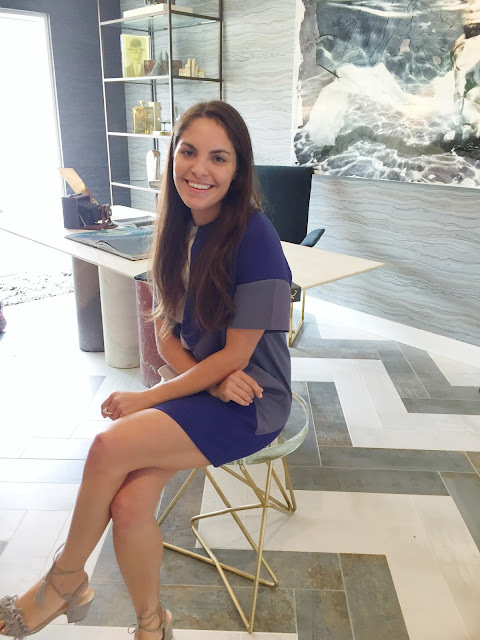 As always, powder rooms are the easiest ways to experiment with your taste and put patterns together that perhaps would be too overpowering or strong filling a larger space. Salvador Cameron did a wonderful job managing color and pattern while remaining fresh and sophisticated. Christopher Kennedy himself designed the dinning room with such a great sense of color that really served as a centerpiece for the entire home. The pink and green, and bits of pastel in between, really embodied the vibrancy of the city's colorful doors and Kelly's bright style sense. 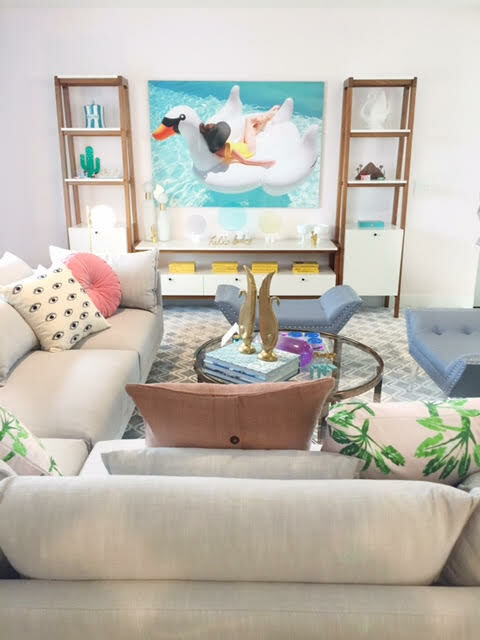 My favorite part of the room of course are the pastel rich paintings and I think they really anchor the entire room that might otherwise appear, if I might dare to suggest, too colorful... Don't shoot me Palm Springs! Kelly herself designed this self-proclaimed "glamily" room and it felt nothing short of glamorous, but also relaxed and calming. There were lots of neutral tones mixed with bright pops of artwork and accessories, my favorite being the poodle bookends (see below) and a bright turquoise Crosley record player I couldn't get a good picture of. It felt very comfortable, like a nice cool place to escape the sunshine for a few hours. 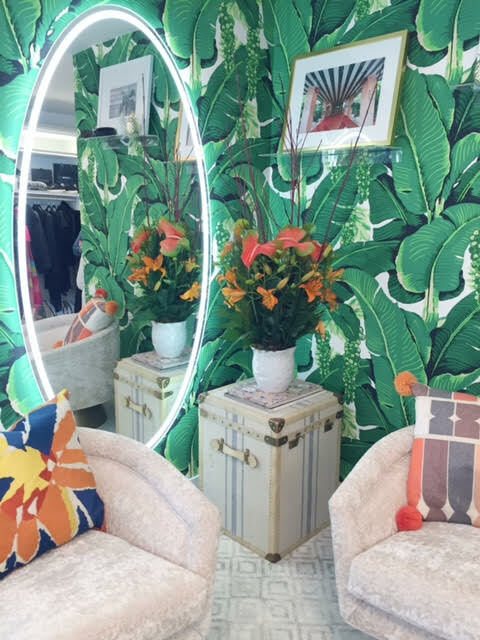 Perhaps the dreamiest part of the entire space was Kelly's "cloffice" designed by Natasha Minasian, who basically termed a concept that I myself, and I am sure many bloggers, can get behind, a combined office and closet! How chic is that?! 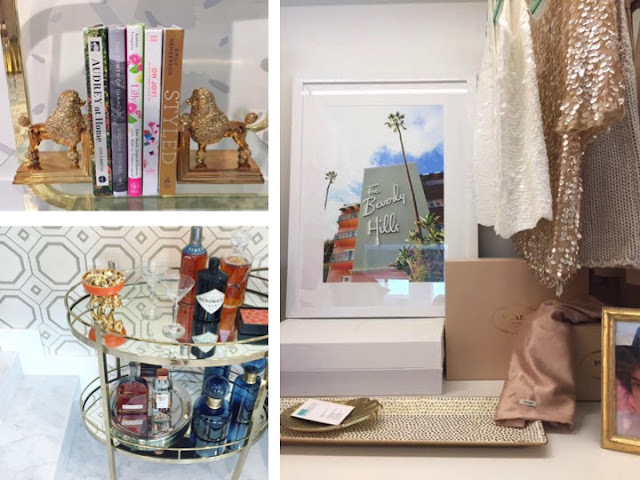 I loved how many hints of my favorite place in Los Angeles (and I am assuming Kelly's as well) were present with the banana leaf wallpaper (not martinique but very similar) and photography of the iconic entry way and facade of the Beverly Hills Hotel. I just LOVE the idea of sitting and drinking with my girlfriends in my cloffice! Can you imagine? It's basically like getting ready with a friend but you have more space to entertain while you try on fifty things before going back to your original outfit idea. And of course, I would add a bar cart too. I am starting to realize I really only need one room, a big room for my clothes, desk, bar cart and sofa. Speaking of bar carts, Maya Williams, the designer of the master bathroom, stepped it up to a full on bar inside the bathroom and right on the edge of the master bedroom. 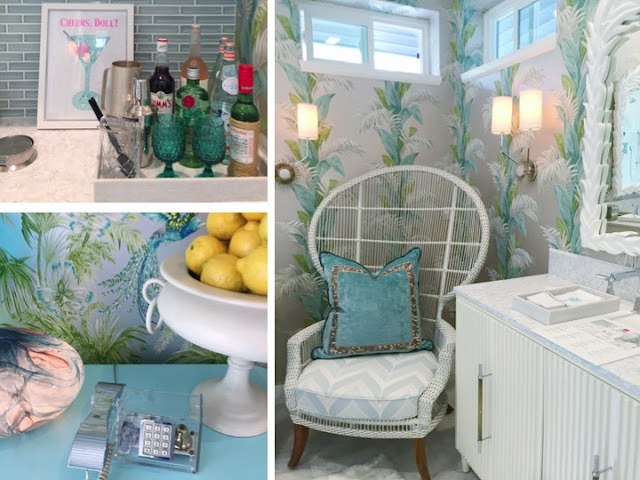 I absolutely loved the accents of green and blue in the most beautiful wallpaper. It went so well with my favorite bottles of spirits on the bar and really tied both of the adjoining master bathroom and Kelly's cloffice together well. I didn't get a good enough photo of the window looking outside but it perfectly surrounded the built in bathtub for perfect views of the pool and mountains in addition to a very lovely walk in shower. 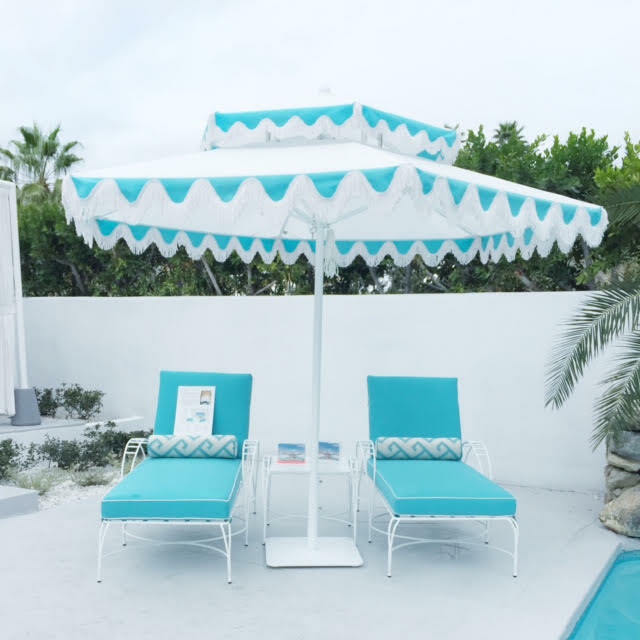 And of course, my favorite beach photographer Gray Malin designed the outdoor pool space that had the most amazing tassel umbrella, coming to the market this April in a collaboration with Santa Barbara Designs. 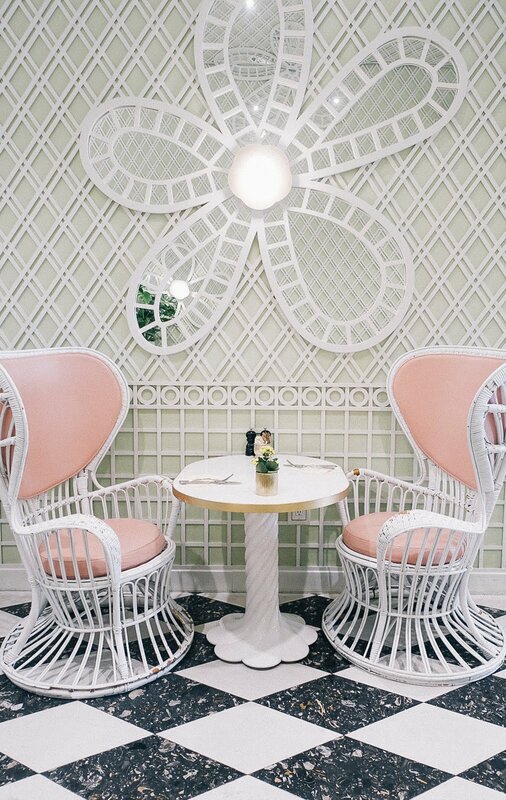 It reminded me of Palm Beach and Slim Aarons photography, which is exactly the inspiration both Gray and Kelly seem to base most of their work around. It perfectly matched the pool colors and tied in with the master bedroom, where the pool views are spectacular. A mix of details pictured above, all from varying rooms in the house but just another reflection of how cohesive the design throughout the show house was. Starting with the recreation of the iconic Slim Aaron's Poolside Gossip photo, shot by Kelly's husband and photographer, Fred Moser at the Kaufman House. The Beyoncé lyric references were just too good to pass up and actually were part of the bathroom mentioned earlier and designed by Salvador Camarena. In case you can't make out the text it reads: dial 9 to call Becky with the good hair. I need this. 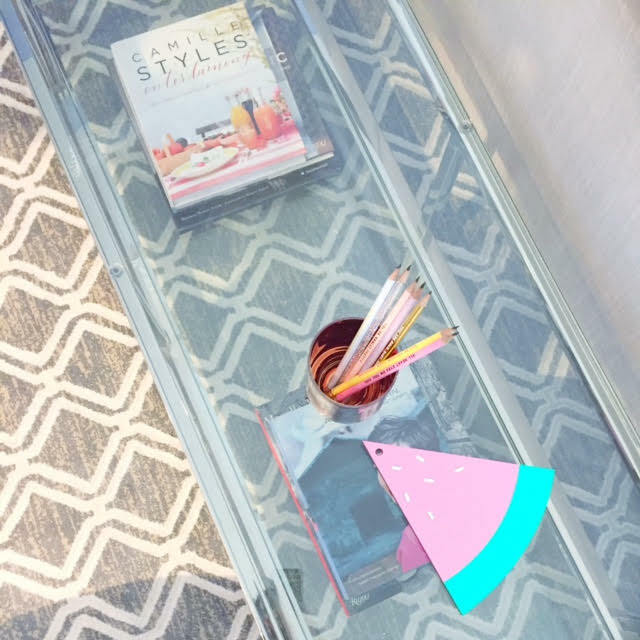 Another detail from Kelly's Glamily room, I just love colorful coffee table books and accessories, especially with a lucite or grey backdrop. The blues and greys are my version of neutrals, nothing makes me happier then a little pop of pink! 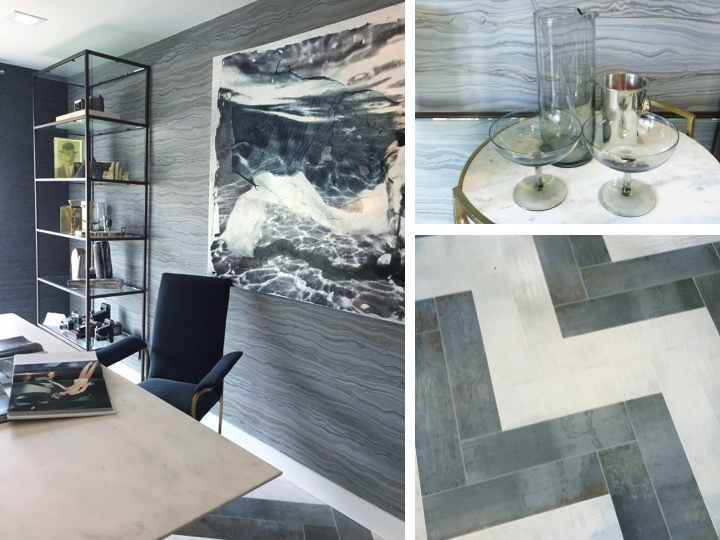 Michel Boyd did a wonderful job with this marble and grey themed office. It's instantly soothing to walk into after all the very bright and sunny themes that pervade the rest of the house. As much as I love color, I think this serves as a better version of neutral in a very sleek way and serves as somewhat of a chill room to refresh and create. It's as if the blank slate became a gray slab of cool marble, a perfect place to start something new. And I just can't get over this lovely this flooring, such a great pattern and color combination! And of course I had to take a picture with the lovely floor, which kind of matched my dress, which this picture, unfortunately, doesn't clearly depict. All in all, such a lovely show house! 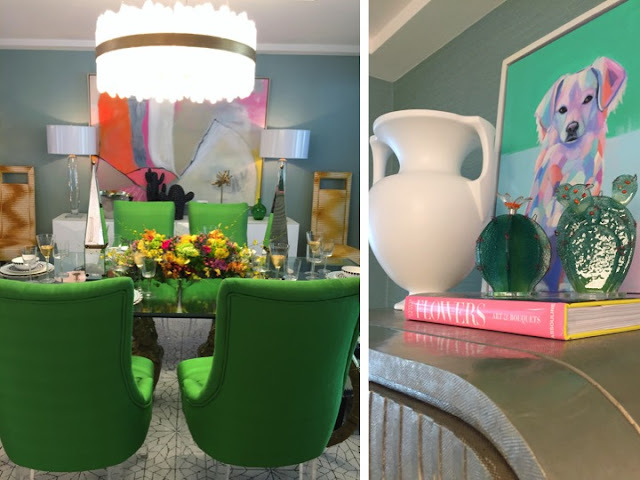 Thank you Christopher Kennedy, Kelly Golightly, Traditional Home Magazine, Modernism Week and all the talented designers for organizing such a wonderful event!